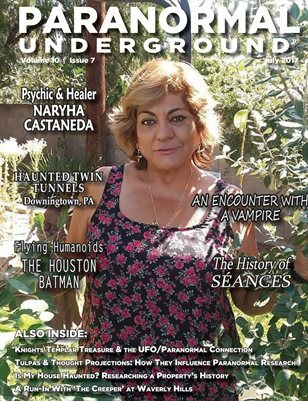 In this issue of “Paranormal Underground” magazine, we spotlight psychic and healer Naryha Castaneda and “The Gardella Vampire Hunters” author Colleen Gleason. In our Case Files of the Unknown, we feature the haunted twin tunnels in Downingtown, PA; the Knights Templar treasure and the UFO/paranormal connection; and flying humanoids, including the Houston Batman. We also take a look at how tulpas and thought projections influence the paranormal research field; why “magic words” aren’t all that we should pay attention to during a psychic reading; and a shaman’s experience during psychic detective work. Also in this issue, don’t miss our coverage about a real-life encounter with a vampire, the history of séances, a run-in with “the creeper” at Waverly Hills Sanatorium, and one person’s search to determine if her property was haunted. For Paranormal Underground magazine’s digital archive, visit For our digital archive, visit paranormalunderground dot net!